David Bowie fans will cherish this sensational collectible 35mm film cell display, featuring an authentic film clip taken of Bowie during performance. 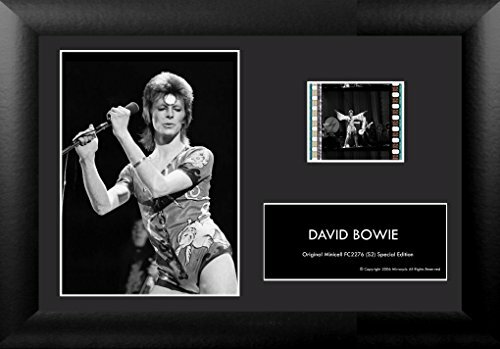 Film cell display is a compact 7" x 5", and includes a great film cell of Bowie as well as a high resolution companion image and title plate. All is professionally double-matted and framed behind plexiglass in black ash. Your cell also has a COA sticker on the obverse as well as easel stand and care instructions for your cell. Display ships in a durable, clear clamshell case suitable for storage and protection. A fantastic David Bowie collectible, beautifully rendered . Features 35mm Film Clip from Actual Vintage Reels of Bowie in Performance! If you have any questions about this product by Film Cells, contact us by completing and submitting the form below. If you are looking for a specif part number, please include it with your message.